Excellent Growth and Tissue Repair. Natural algae to enhance colour. 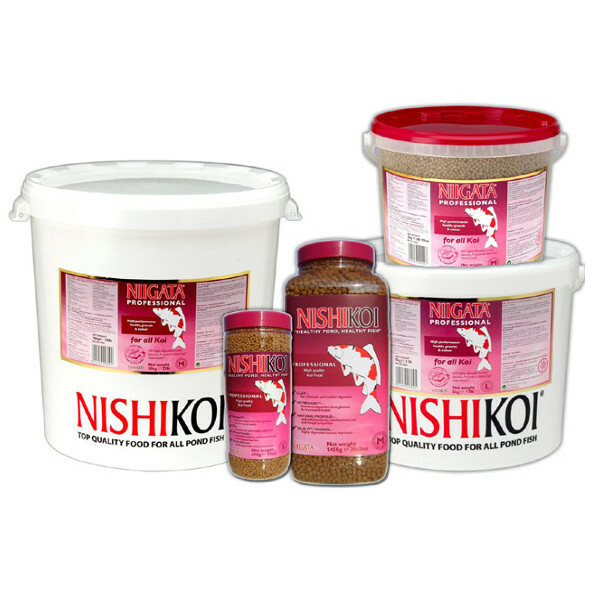 Now with Nishi®-Guard immunostimulant for extra health benefits. Montmorillonite Clay Natural mineral supplement for skin quality. Niigata® Professional Koi is a high performance ‘natural’ diet based on the recommendations of professional Japanese koi farmers. The excellent conditions and diet experienced by koi when farmed and reared in clay ponds is unsurpassed for promoting excellent health, growth and colour. Recognising this, Niigata Professional Koi Food reproduces many of the beneficial features of a clay pond environment, incorporating additional features that have been recommended by professional koi farmers from Niigata. Formulation includes Nishi-Clay, Propolis and Nishi-Guard to boost koi health and Spirulina to enhance koi colour.